Rising 3,099 meters (10,167 ft.) above sea level about 170 kilometers (105 miles) from Chengdu, Mount Emei is the highest of China's four holy Buddhist mountains. 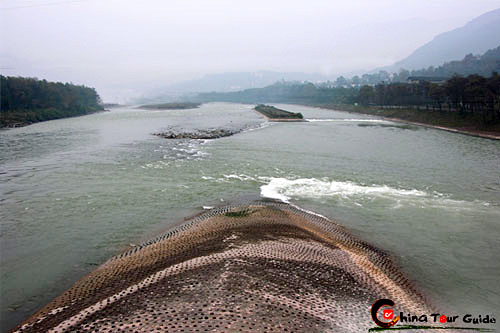 The name "Emei" literally means "delicate eyebrow". This name is derived from two of the mountain's peaks, Wanfo (Ten Thousand Buddha) Summit and Golden Summit, which face each other and resemble the delicate eyebrows of a Chinese beauty. 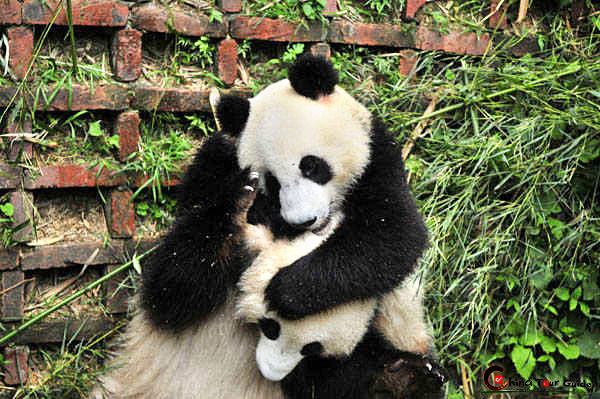 Situated in the southwest area of Sichuan Basin, Emei Mountain flourishes in its temperate climate. Abundant rainfall gives rise to luxuriant green all year round and provides a perfect environment for hundreds of species of rare animals and plants. From the foot of the mountain to its summit, the Peak of Ten Thousand Buddha, there is a trail totaling some 60 kilometers (37 miles) in length. It is endowed with unique changeable weather and marvelous natural beauty. The sunset on the Mount Emei. 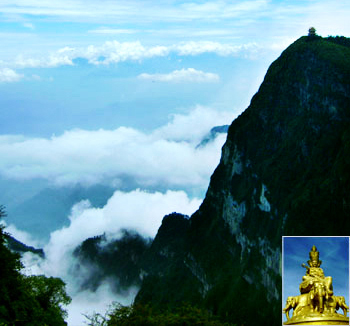 Golden summit palace of Mount Emei in the cloud sea. 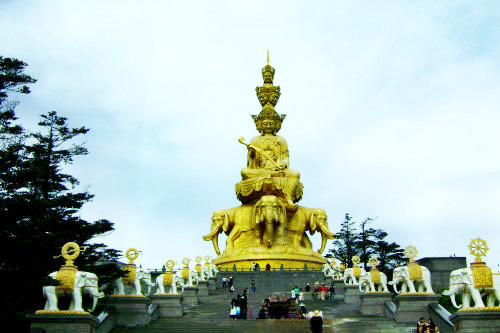 Ever since Buddhism arrived in China, Mount Emei has been an important center of refuge and retreat for pilgrims. After the spread of Buddhism during the Tang and Song dynasties, many Buddhist temples were built here. There used to be more than 100 temples and shrines on the mountain, but only about 30 still stand today. A legend claims that the mountain was where Samantabhadra gave lectures on Buddhism and most temples house a statue of him. 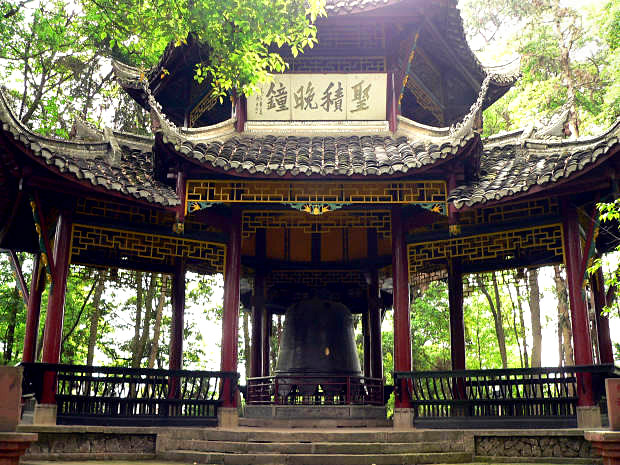 Mount Emei is home to a number of scenic and religious spots including: Baoguo Temple, Wannian Temple, Fohu Temple, Qingyin Pavilion, Heilongjiang Tunnel, Hongchun Platform, Xianfeng Temple (Jiulao Cave), Xixiang Pond, and Golden Summit. Samantabhadra the world's highest Buddha. 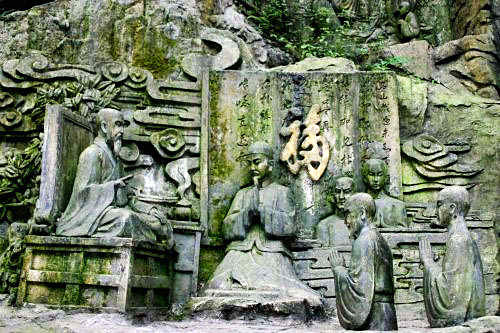 Stone Carvings on the road to the peak of Mount Emei. At the foot of Mt. 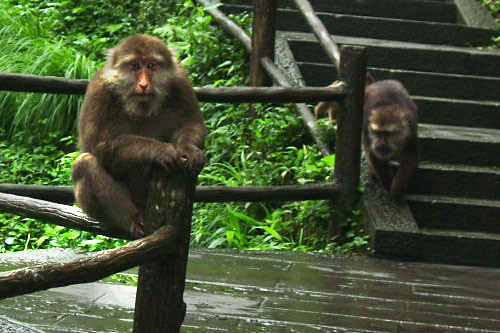 Emei, Baoguo Temple is the first sight one meets along the route up the mountain. It is the largest temple on Mt. 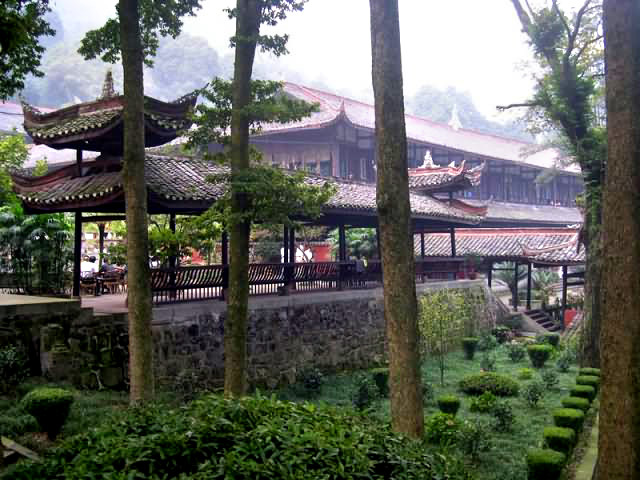 Emei and was built during the Ming Dynasty (1368-1644). 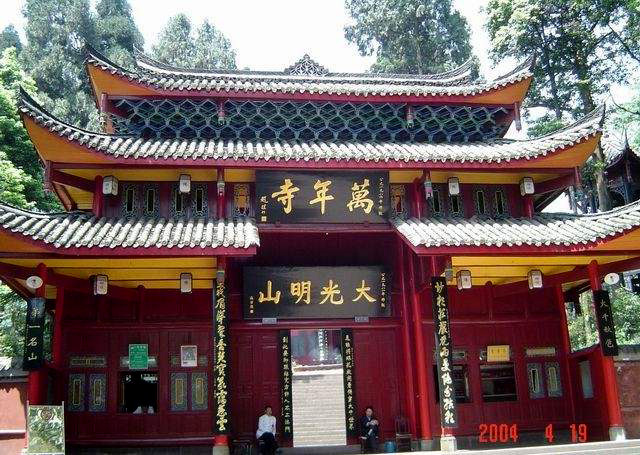 The temple is the center of Buddhist activities on the mountain and was formerly called Huizong Hall, which means combination of three religions, namely Buddhism, Taoism and Confucianism. Emperor Kangxi of the Qing Dynasty (1644-1911) granted the name "Baoguo" to the temple, since in the Buddhist doctrine, Baoguo (dedication to one's nation) is the first duty. 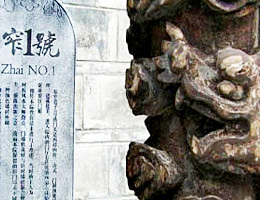 One of its most famous historical relics is the 25-ton bronze Bell, reputedly the second-largest bell in China (after Beijing's Great Bell). The sound produced by the bell is deep, and its echo can be heard up to 15 km (9 miles) away. Baoguo temple is also one of the best preserved and most lasting representatives of the typical structure of Chinese ancient gardens. Tourists visiting this temple will enjoy a sampling of precious Buddhist cultural relics taking them back years long past as well as serene gardens bringing them back to the beauty of the present. A pavilion in the Baoguo Temple. Baoguo Temple is under the Mount Emei. Lying at the foot of the Mt. 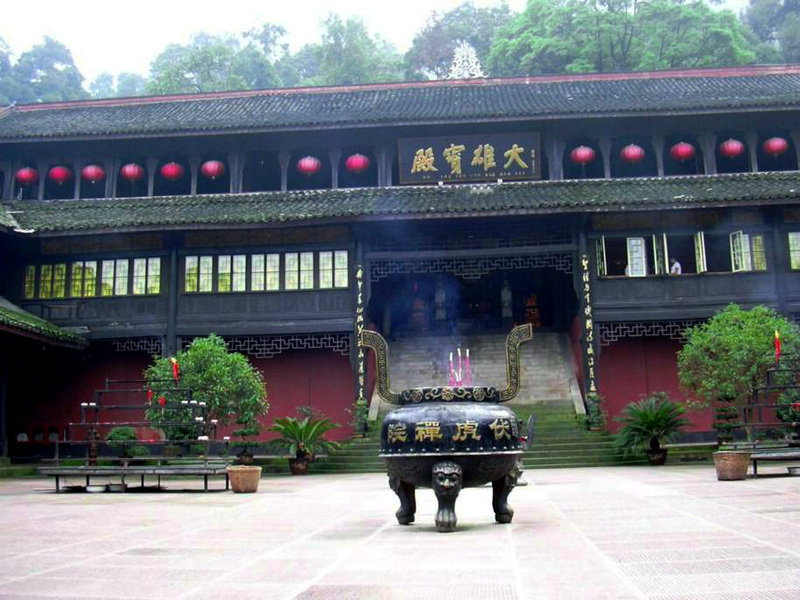 Emei and sunk deep in the forest, Fuhu Temple is the best-kept secret temple on Emei Mountain. The main building of the temple is the "Precious Hall of the Great Hero". The two other largest structures are the "Yuchu Building", and "Huayan Pagoda Pavilion". Standing 5.8 meters high (19 feet), the copper pagoda was built during the Yuan Dynasty (1271-1368). Its eight angles are symmetric and the tower itself is carved with splendid Buddhist scriptures from "the Sutra of the Master of Healthiness". Due to inconvenient location and the difficulty of trekking Fuhu Temple, it hasn't been visited often and is well-preserved and largely unspoiled. People who have been here often wonder at its amazing construction. After a long trek it makes for a nice secluded spot to sip tea and silently take in the scenery. As one of the most ancient temples on Emei Mountain, the Wannian Temple dates back to the Jin Dynasty (280-316) and was dedicated to the Bodhisattva Puxian, Who is the protector of the mountain. The original scale of the temple was grand with superb design and craftsmanship. After going through many fires, all of the ornate wooden temple halls were completely burned leaving only the Brick Hall built during the Ming Dynasty (1368-1644) left today. While rebuilding the temple, the workers adopted architectural techniques from India and Burma in order to make it fire-proof. Inside the Brick Hall, a bronze statue of Bodhisattva Puxian, the Buddhist "Lord of Truth", is enshrined sitting on a white elephant. This is 7.3 meters tall (24 feet) and weighs 62 tons. The statue was skillfully crafted. The lotus flowers as well as the six-tusked elephant are well proportioned and extremely vivid. 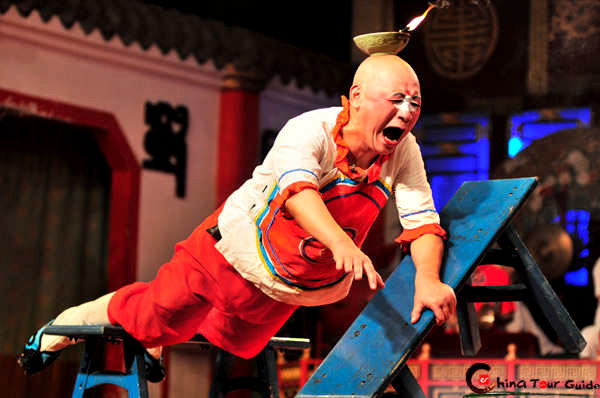 It is representative of the foundry art practiced during the Song Dynasty (960-1279) and is a highlight of the temple. The main entrance of the Wannian Temple. A monkey on the plank road. Huazang Temple sits at 3,077 meters (10095 ft.) above sea level on top of Golden Summit, Mt. Emei. This is the main peak (though not the highest point) of Emei Mountain, which is the highest of all the most common mountain tourist destinations in China. Huangzang Temple was constructed during the Ming Dynasty (1368-1644) and was restored in the 1970's to its original condition. 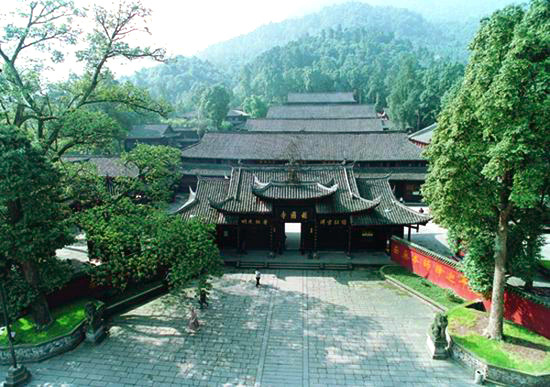 It contains three halls: the Laughing Buddha hall, the Great Hero hall and the hall of Universal Benevolence god. The Golden Summit is well known both for its spectacular views and the Huazang Temple, in the sunshine which appears golden and looks resplendent and magnificent. 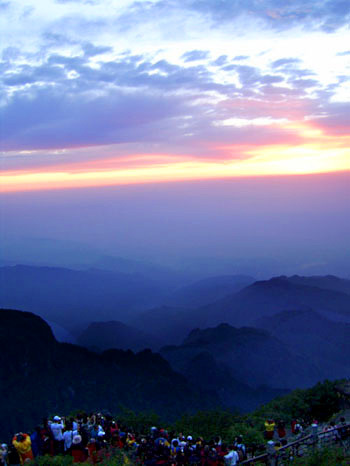 The summit is the best place to experience the four wonders of Mount Emei: Buddha's Halo (rainbow-like rings that surround and move with your shadow), the Sea of Clouds, the Divine Lights and the Golden Summit Sunrise. From the summit, tourists can also take a monorail along the ridge to Ten Thousand Buddha Summit, the true peak of the mountain.